This set of chairs consist of a finely carved top rail with scroll and fan decoration, a shaped and carved back support and shaped uprights leading down to an upholstered seat (once purchased the seats could easily be re-upholstered in a fabric of choice). 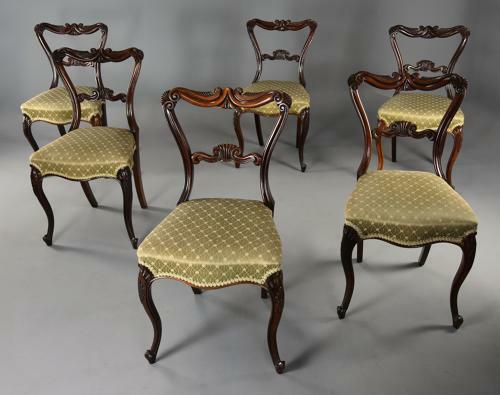 This leads down to a serpentine shaped seat rail to the front and also to the sides, the chairs supported by carved cabriole legs to the front with outswept legs to the back terminating with a scroll toe. There is evidence of a retailer label to the underside of the seat rail, J J Helsdon were based in Lincolns Inn Fields, London. This set of chairs are in very good condition for age, are of stable construction and can go straight into a home.